Reputation management is a tricky thing in today’s social media landscape. While the days of rogue tweets being sent out by an employee seem to be much fewer than in previous years, the power of social media when it comes to a brand’s reputation is huge. The best thing a brand can do to be prepared for times of crisis is to have a solid plan in place. Having strategies in hand whether you’re dealing with a disgruntled customer or employee, or are on the wrong side of a trending hashtag, are crucial if you want to make the best of of a bad situation. People don’t just want a quick reply, they expect one. Not replying quickly is equated to not caring. Even if you’re in a holding position, let them know they’ve been heard. Be honest about your mistakes. Did you make a mistake? If so, apologize. Write like you would talk to them if they were in the same room with you. Explain why it happened, and explain your course of action. What will you do, and what have you already put in place to make sure it doesn’t happen again. This isn’t always done, but following up after the crisis has ended is an added layer of customer care. 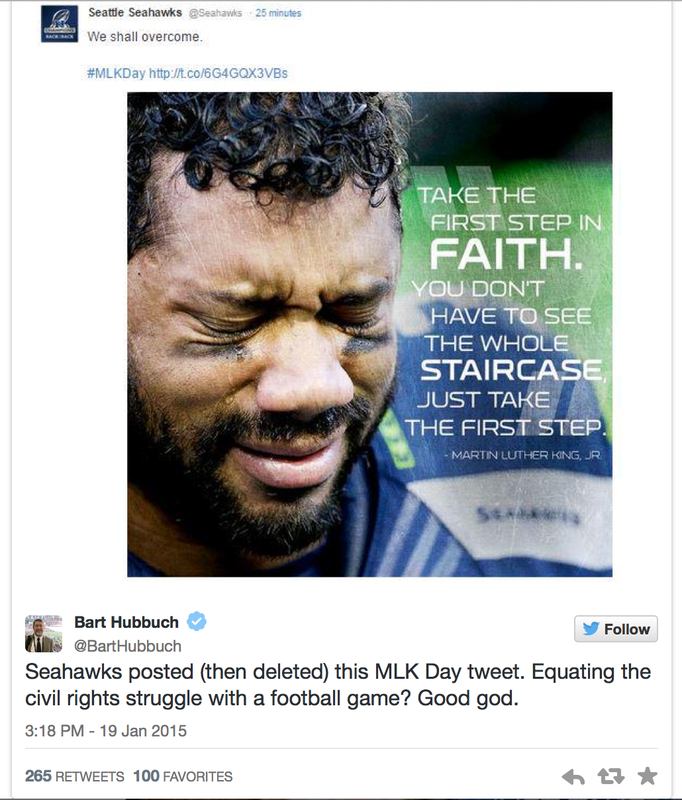 Unfortunately, the Seattle Seahawks had such an occasion to test out their social media crisis plan on Martin Luther King, Jr. Day. After their incredible comeback win against the Green Bay Packers in overtime of the NFC championship game, the Seattle Seahawks posted a photo of their inspirational quarterback, Russell Wilson, as an MLK Day tribute on Twitter. They later deleted the tweet. Many folks responded very negatively on social media, expressing negative comments that the Seahawks would compare winning a football game to the fight for civil rights. This was just one of many, many tweets admonishing the Seattle Seahawks for what many believed was a poor choice of a MLK Day tie-in. After which there were more mixed comments. So, let’s evaluate their response, based on the key components listed above. The Seahawks posted the initial tweet at 2:45 and by 4:28 had issued their apology. Deleting the tweet and issuing the apology also does this. 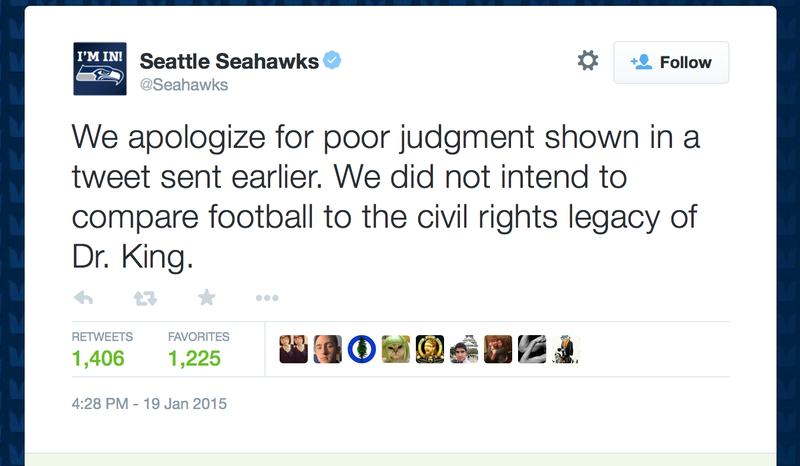 The Seahawks were clear that they did not intend to make the comparison to civil rights. Again, they said they didn’t intend to make the comparison of a football game to civil rights. I didn’t find any follow up. I don’t think it was necessary in this case because the offended party wasn’t just one person. To have followed up after their apology may have reminded folks of their mistake after the crisis had dies down. Based on their reaction, the Seahawks clearly had a plan in place to deal with a social media crisis, or, at the very least, had a team in place to deal with the crisis when it happened. What do you think? Did the Seahawks do the right thing? Would you have responded differently? Based on the criteria you mention on your post, I think the Seahwaks did the right thing in the most apologetic, human, and sincere way. The fact of the matter is that the message was out of line. It’s another example of companies wanting to join the conversation using real-time marketing, but in the wrong way. When this is done, companies need to anticipate what will be the public’s reaction to such a message, especially when they make reference to someone like Martin Luther King, Jr. who fought for civil rights and who people associate with this. My point is that this can be avoided if companies take some time to think about what may happen before posting. Regarding their response, I agree with you regarding the fact that they did it rapidly, acknowledged poor judgement, apologized, and stressed the fact that there was no intention of comparing football to civil rights. There was no intention, but again, reading the message, testing it with some people would have kept them from posting the message in the first place. This case reminds me when DiGiorno used a hashtag associated with domestic violence to sell pizza.This Tweet read: “#WhyIStayed You had Pizza.” They later deleted the post and said: “A million apologies. Did not read what the hashtag was about before posting.” I’m not sure how this can happen, but it’s also an example of a company not doing sufficient research before, post something potentially offensive, and then have to deal with its reputation because people went crazy. Their response was sincere and we can tell they were listening. Maybe some additional comments about the specific course of action would have helped. I think you’re right, Celeste. I think the thing of note in the case of the Seattle Seahawks’ post is that they probably should’ve thought this photo through, keeping in mind if it could be seen negatively by anyone. It’s kind of a shame that we have to be so vigilant in not only defending but preventing these sort of reactions by thinking if anyone, anywhere could take our statements or visuals in a different way, but this is marketing. Sometimes, I think that when you’re close to a project, you may not see it the way it truly is. In my Yearbook class, I teach my students this by showing them what they think should be obvious typos. It helps them see that an outside perspective is important when developing content. Sometimes we can’t see something right in front of us because we’re just too close to it. We actually had this happen with our book last year. We had a beautifully designed tree on the cover with leaves falling from it; our theme was Growing. We repeated some of these elements throughout our yearbook, having continuity of design. However, it wasn’t until I asked an outside person to take a last look at the pages that I noticed something they pointed out to me: some of the beautiful green oak leaves looked way too much like marijuana leaves. I was absolutely horrified! It had almost gone to print like that. Thankfully, I had gotten a pair of outside eyes — something I always recommend really saved me in that case and also could’ve prevented the Seahawks from having to deal with this social media crisis. You’re featuring an interesting example on your blog this week. 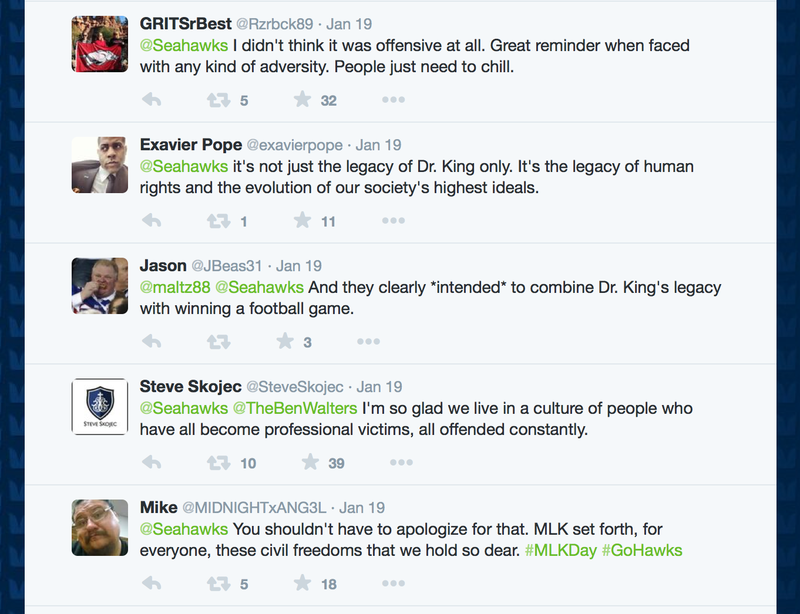 The reason I think it’s an interesting example is because the post that Seahawks decided to use for to celebrate the MLK Day could be read as offensive by some, while others can just say that people are exaggerating and are “need to chill.” Are we really a society of “professional victims”, like one of the comments states or do companies and organizations need to be held to a higher standard, especially when it comes to social media. I believe that, as Digital Natives, we have a different relationship with brands and organizations we love and believe in. We want them to be more responsible. We want them to do the right thing – it’s a part of how our most beloved organizations market themselves. I don’t think that the tweet from Seahawks was terribly offensive, but I definitely think their creative director made the wrong choice. Maybe it’s time for them to think about someone managing their social media professionally? Their overall social media presence isn’t that impressive. Well said, as usual, Aldona. I do think that as Digital Natives we expect the brands we love and follow to be responsible. Like I mentioned to Celeste, I think if the Seahawks had gotten a pair of outside eyes on this content before publishing it, they may have been able to avoid this snafu. I actually don’t think their tweet was terribly offensive, either. It certainly didn’t intend to offend anyone, but it’s clear at this point that they made the wrong choice in publishing this content. In the future, they will probably be more cautious when entering into conversations or commenting on events that they didn’t start. First, great post! It was well developed and had great visual content. I think you touched on one of the most important things in terms of social media mishaps in that a plan should be in place for handling a potential crisis. While we hope every post is successful, there is always a chance for a mistake, after all we are human. We cannot anticipate how every reader will interpret a message, however, we can prepare for these situations. In my opinion the Seahawks should not have received such a lashing for this post. Some individuals unfortunately take offense to everything, and if its not presented according to their views than its wrong. It is pretty obvious there was no malice in this Tweet; in fact if I was the person deleting it, I would do so rolling my eyes. The thought in my mind, “Oh my, people are so sensitive and read way to much into things, not everything is an insult!” As one response stated people have become “professional victims.” You did a great job running through the check list and in my opinion the Seahawks did everything by the book. I would be interested to see what the post on future MLK Days. Reactions like this is exactly why businesses stay away from social media, damned if you do, damned if you don’t. The only thing I would have done differently is acknowledge those followers who clearly understood they had no bad intentions. Thank the people who defended them and let them know you appreciate that, its important to let them know they are heard as loud as the complaints. Thanks, Alicia! I appreciate the feedback. It was a fun post to analyze as an example of handing a social media crisis, mostly because it wasn’t a rogue employee or a real PR issue. It was, essentially, how to handle an unintended consequence. Unintended consequences are becoming more and more of an issue for social media managers precisely because we need to be on our toes for a tweet or post being taken the wrong way. Another great example of this is CNN’s #AskACop. They asked folks to pose questions to NYPD officers using that hashtag. Unfortunately for CNN and police everywhere, the hashtag had the unintended consequence of giving a megaphone to folks with huge police grievances. It became an outlet for folks to voice their frustration over what many saw as racist actions by the NYPD instead of resulting in the dialogue that they wanted. You’d have to imagine this would have been the reaction to the hashtag, though. I wonder why no one supposed it could go the way it did. Personally, I don’t see what the big deal was about the post. I know that a lot of people are super sensitive, but in my opinion, the post was very positive. I understand that the path to civil rights can not be compared to the path that they took to win the football game, but still. They were using an inspirational MLK quote in a positive manner for MLK day. Would it have been better if they chose to not use a MLK quote at all? I feel like the social media team was trying to be relevant for their audience and relate two events together. Like you, I felt that the tone of the message was sincere. I also felt that the apology that they gave was sincere. I believe that they didn’t mean to offend anyone by posting the quote. One of the comments made on the post was by Steve Skojec and it read “I’m so glad we live in a culture of people who have all become professional victims, all offended constantly”. I completely agree with this. As a brand, you can’t take a side or stand for what you believe in. Someone is always going to be offended by your message, regardless of what it is. I feel like this doesn’t allow brands to take creative liberties with their brand voice. It makes social media marketing very bland in many cases. Great post! Hi, Whitney! I appreciate your comments. I agree that the Seahawks social media team was probably trying to be relevant to their audience with this post. I think because of the sincerity of the initial post and their response, the Seahawks avoided an even bigger social media response. I think this post and the reaction to it shows that we need to be prepared at all times. KLM taught us that in this week’s material to be sure! Maybe more folks would’ve come out in support if the Seahawks had explained why they made the connection rather than just deleting when it wasn’t universally approved of. From a PR perspective, I think they did the right thing deleting the tweet, therefore removing the source of the crisis. However, from a personal standpoint, I agree with you that these sorts of possibilities do squash creativity that some brands would use online.